Four in 10 of those who plan to follow the Olympics this summer will do so on two or more devices, according to a new study commissioned by mobile marketing company Velti. The survey, conducted by Harris Interactive, also found that 35% of U.S tablet owners will use their devices to get Olympics coverage, while 27% of smartphone users will do the same. Across both devices, more people are likely to track the Games through the mobile Web than applications. Among those who plan to follow events via smartphone, 77% will tune in using a browser -- including reading articles or blogs, watching video clips, streaming live coverage or catching up through social media -- while 63% will use an Olympics-specific or other type of app. Among tablet users, 80% will use a browser and 58% will turn to apps.Tablet owners are more likely to watch Olympic video content on their devices. Half will do so via the mobile Web, while 45% will stream live coverage. On the smartphone side, 45% will watch video clips and replays, and 41% will stream live programming. This year is the first time all 302 Olympic events in 32 sports will be streamed live. Indeed, NBC’s coverage of the 2012 Summer Games is geared to capture audiences across multiple screens and platforms. Last week, the network introduced a pair of apps for Android phones and tablets, as well as the iPhone and iPad, delivering streaming video and information. 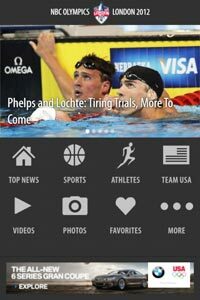 The NBC Olympics Live Companion is designed to function as a second screen for viewers, while its “Live Extra” app provides live streaming of every event. Yahoo’s Olympics programming blitz is likewise tailored to PC, mobile and tablet screens, and will provide a second-screen experience through its IntoNow app. Marketers are getting in on the act, too. Citi, for example, is sponsoring the Yahoo Olympic Medal Count on the PC, as well as its Olympics app and mobile pages. *14% of U.S. adults will track the Olympics on three or more devices. *Of those who keep up with the Olympics this summer: 36% will watch on TV and a computer; 11% will use a TV and a smartphone; and 10% will use a computer and their smartphone. *Almost four in 10 people using their smartphones to follow the Olympics will also do so by connecting with others by calling them or via texting. *Among men 18-34, 83% plan to watch the Olympics compared to 71% of women in the same age group.